The month of March was fairly good to me, until the last week and a bit. Hence why the March Obsessions list is a few days late. Just when I thought the season of being sick was over, the Mister came down with some kind of bug that kept him bed ridden for a weekend. A few days after he got better I got completely slammed with flu-like symptoms that took me out for half a week. Just as things were getting better, the Munchkin got hit with who knows what for the last few days of the month. I really don't know what it was that he had, all I know was that it was explosive...if you know what I mean! Oi. Knock on wood but so far everyone appears to be fine now and on the mend, the Munchkin has even been runny nose free! Being out of commission for practically a week really set me back on various things...such as project bag production, my knitting needle reviews, and my knitting. For a few days there I was so sick that I couldn't even knit! As my friend Arika has said, I'm never too anything to knit. But I was. And it was horrible. Aside from my raging allergies, I really hope this is the last time I get sick! But enough of all this sickness talk. Let's get on with the 5 things that I couldn't get enough of this month! 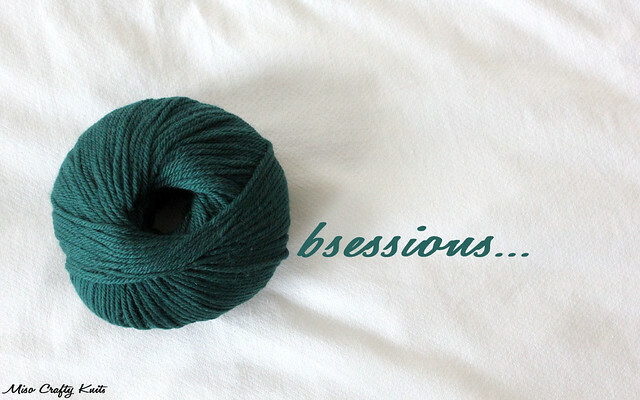 Yes, the Viajante shawl has made it to the Obsessions list...again! This shawl has been plaguing my brain so much that when I got my hank of Wollmeise Lace-Garn I just had to wind it up (thanks again Em for letting me use your beautiful jumbo swift and fabulous winder!). It didn't even matter that I had a few WIPs on the go and that I should have really waited until at least one of them was off the needles. Instead, when that behemoth of a lace hank was ready to go, I gnawed at my bottom lip until I couldn't take it any more and I cast that baby on! You got to give me a little credit though. I did resist a mere 12 hours after winding the yarn before casting on. That shows a little will power...right? Back when I was teaching myself and practicing how to knit continental style, I would always fume at my clumsiness when it came to purling. I was by no means even close to elegant, fast, or efficient when it came to the knit stitch in continental but I was at least comfortable with how I was working that stitch. Purling, not so much. It was awkward, it was messy, it was loose, and it was downright a drag. So much so that I never attempted to even try purling in continental ever again. But then I heard about the Norwegian Purl. How you don't need to bring the yarn forward at all, how it makes it easier for those who aren't fans of purling to actually get the job done in a pleasant manner. I was intrigued. After watching a few Youtube videos (and failing miserably in all attempts at trying to accomplish just one purl stitch) I did a little Google-fu and I came across Kate Atherley's (aka Wise Hilda) blog post about on how to execute this very technique (and for the record, Kate is a thrower who can knit continental and can relate to my purling in continental woes). After some fiddling around I finally got it! Then I managed to knit 2 inches worth of 1x1 ribbing in continental using the Norwegian Purl. I wasn't any faster and I think my hand movements were the same as if I were to knit it English style, but my gauge matched the rest of the project and most of all, I was able to knit the Norwegian Purl with ease. I think from here on in I'm going to not mind having to knit 1x1 ribbing, or any kind of ribbing, any more. Oooohhh yeah!! I discovered this little phallic looking (among other things) contraption on one of the boards that I follow on Ravelry at the beginning of the month and have been obsessed with it ever since. It seemed like everyone and their dog had one. What is it? It's a Yarn Buddy, a yarn caddy, a lazy yarn susan...the list of names that this thing is called goes on and on, but basically it's a yarn holder that you can plop your cake or even skein of yarn onto and in a lazy susan fashion it'll spin along as you knit. No more yanking or pulling your yarn! Don't get me wrong, I absolutely love my yarn bowl. But I find larger cakes like my Wollmeise Lace and bulkier yarns like Cascade Eco Wool are just too big for my yarn bowl. And since I knit from the outside in, sometimes the yarn bowl is a hinderance as the yarn will sometimes catch on the groove meant to feed the yarn. When I'm on a knitterly roll, I usually position my yarn in front of me so that the yarn can unwind without any interference and with minimal yanking. The Yarn Buddy could help me with this very issue! I've been searching the web high and low for the right holder and find myself getting deterred from actually purchasing one due to the astronomically high shipping prices. So I'm hoping that when I go to Seattle later this week for Vogue Knitting Live, that I'll be able to find and take one home from the marketplace. Fingers crossed that there will be some there! I've always had a fondness for polka dots but they really haven't made much of an appearance anywhere in my life. Until now. I really don't know how it came to be but all of a sudden I have an immense urge to line all my project bags in yummy polka dot fabric, to give myself a cute dotticure, and to sew up some fun skirts and maybe even dresses in this classic print. My supply of polka dot fabric is pretty minimal (which I must remedy soon!) but I'm über pleased with the cuteness factor of the bags that I have made with polka dot lining. One hazard of making project bags for a living - wanting to keep them all for yourself!! My goal was to sew up at least 3/4 of my fabric stash before allowing myself to purchase more. But I think I'll be ordering fabric sooner than later and you bet there will be a ton of fun polka dots in there! Totes! I've always had insanely dry hands and horrifically rough cuticles. I swear, I think I've tried everything on the market to tame my cuticles but alas, nothing worked. Cuticle oils were too greasy and messy, lotions weren't strong enough, and most creams were crap. Now that I've been painting my nails more though, I feel like a great paint job could go to waste because my cuticles look so gnarly. So I went on a hunt. I purchased a few so-called cremes that turned out to be major fails, an oil that stained everything I touched, and a lotion that made me itch. What's a nail polish fanatic to do? Peruse all those beauty and nail polish blogs out there in the blogosphere of couse! 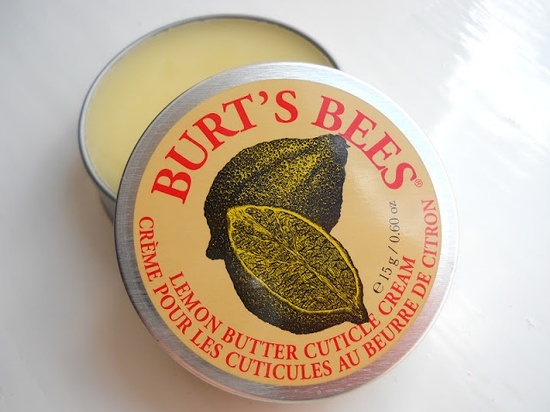 And the main product that kept coming up was Burt's Bees Lemon Butter Cuticle Cream. Considering my current track record, I was a bit nervous to try this one out. But I went to my nearest drug store to check it out. Not only was it made with all natural ingredients, but it was affordable AND it smelled like lemon meringue pie! Um, I'll give it a go. And boy, am I glad I did! While it does make your skin feel a little greasy for a few minutes after applying, this stuff sinks in quick. Even after the first application my cuticles felt moisturized and soft and they even looked smooth. I've been using this cream for a few weeks now and my cuticles are in such better condition!! Best of all, a little goes a long way so my little pot doesn't even look like it's been touched! To say I'm hooked is an understatement! Well, that's my March for you. What have you been thinking about non-stop? Now that April is here, and so is the sun, I can't wait to see what the new month brings! Ohhh I Too Will Now Be Obsessing Over The Yarn Buddy! Isn't it a cool contraption? I can definitely see this as a very useful tool in my knitting! Funny how it works but I have been obsessing over poka dots for sometime now. There is even a debate in my office over stripes or poka dots being in right now. Europe always sets the trends at least 6 months ahead of us and poka dots are hot, stripes were last season. Or it could just be how pretty and spring/summer poka dots can look. I'm ready for spring, no one gets a spring flue do they? I don't think I'm ready for spring 100%. Mentally, yes. But when it comes to my wardrobe? No. This is a great list! Love the Yarn Buddy (I think I neeeeed one, hehe!) and I'm definitely going to give the Burts Bees a try for my horrendous cuticles.